Courtney and Victor were engaged while standing on a bridge watching fireworks, so it was only fitting that the pair say their "I Do's" on Sarasota wedding venue Bakers Ranch's bridge. "The breathtaking ceremony site won us over!" the bride gushed. "When we saw Love Locks Bridge, we knew that this was the place we were going to get married." 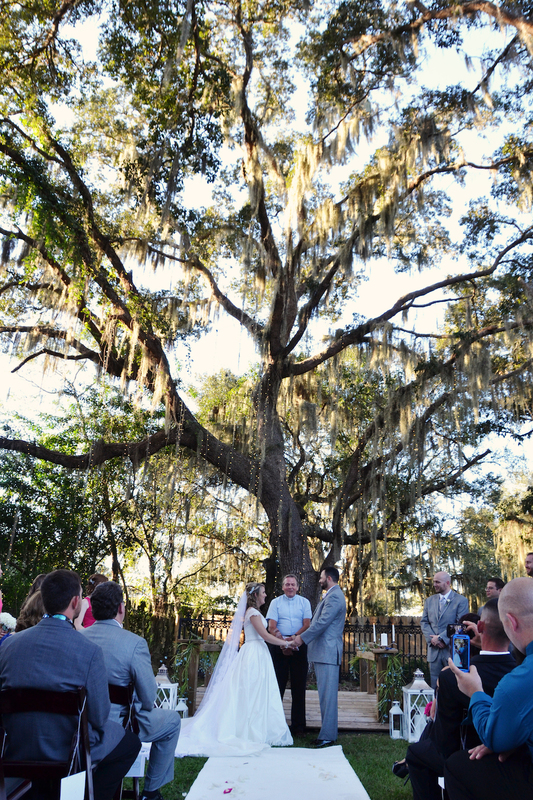 The Tampa couple hosted a romantic, fall wedding at our Sarasota wedding venue. "I chose various shades of pink and greys. There were also pops of blues, purples, orange, and red. I chose these colors because I think all of them together portray the classic romantic theme we wanted," Courtney shared. Finding a Sarasota wedding venue with both indoor and outdoor locations was important to the couple. "We wanted to be able to embrace the beauty of the outdoors," the bride explained. "We also wanted a wedding venue that would portray the romantic theme of our wedding. 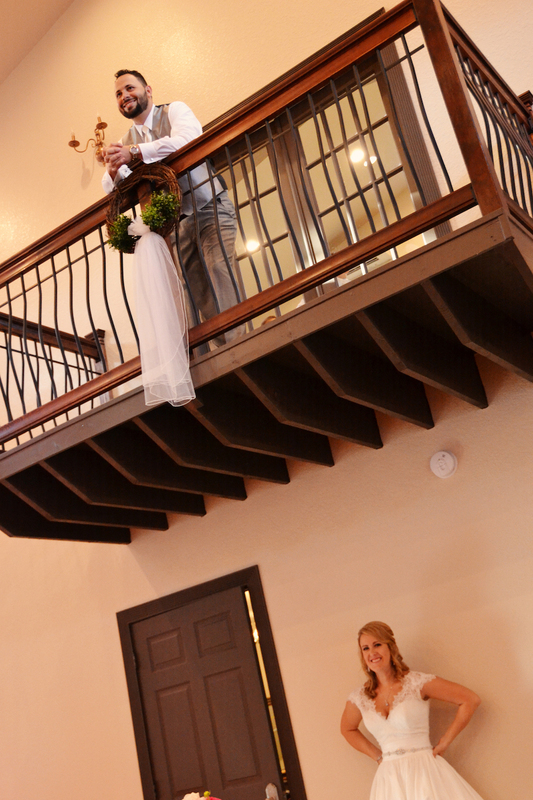 When we toured Bakers Ranch, the balcony overlooking the ballroom took our breath away and won us over!" The Sarasota bride and groom focused on food, their first dance and celebrating with family and friends. "The most memorable moments of our wedding were our romantic ceremony, our first dance, the bouquet and garter toss from the balcony and the groom and all his close guy friends singing "I Want It That Way" by the Backstreet Boys," Courtney reminisced. The Proposal: Victor and I went to Orlando to spend the weekend celebrating a couple of friends' birthdays. On a whim, we decided to extend our weekend stay an extra two days. On Monday night, Victor and I were at dinner with my parents and sisters when we heard fireworks going off. While we were waiting for dinner, we decided to take a walk to watch the fireworks the on the bridge. This is where the man of my dreams got down on one knee to ask me to be his wife. What did you look for in a wedding venue? The first thing we looked for in a venue was the option of both indoor/outdoor ceremony locations. We wanted to be able to embrace the beauty of the outdoors. We also wanted a wedding venue that would portray the romantic theme of our wedding. When we toured Bakers Ranch, the balcony overlooking the ballroom took our breath away and won us over! Bakers Ranch was so wonderful during the wedding planning process. They were available to answer all of our questions from the very beginning to the very end. They were professional, warm and excited to be on this journey with us. On top of the amazing staff, the breathtaking ceremony site won us over! When we saw Love Locks Bridge, we knew that this was the place we were going to get married, since we did get engaged on a bridge! How would you describe your theme? Classic romance. What were your colors? The primary colors I chose for our wedding was various shades of pink and greys. There were also pops of blues, purples, orange and red. I chose these colors because I think all of them together portray the classic romantic theme we wanted. 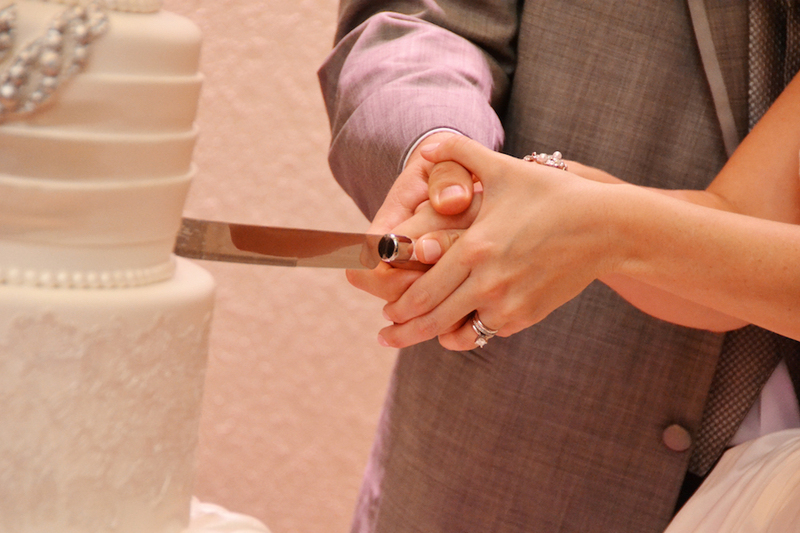 How did you incorporate you and your husband's personalities into the wedding? My husband and I really enjoy classic elegance so the theme for our wedding was a no brainer. What advice would you give to brides considering Bakers Ranch? I would tell brides looking at Bakers Ranch to keep an open mind because it is a blank canvas for the most magical day of your life! There are countless ways to make this amazing venue into the wedding of your dreams.